my hands and feet with! I was so excited that the scent is Peppermint! That is my favorite scent for hand and foot lotion! It made my hands and feet feel so soft! The hand and foot scrub is great too! Thanks to The Homestead Company for helping me to stay calm! 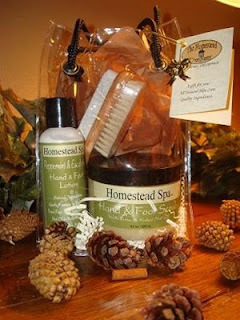 The Homestead Company was created in September of 2005. It was originally started as good-neighbor program to share and help other moms like me find the best, natural alternatives to baby products. It was later conceived as an idea for a home-based business as a way of sharing my knowledge in nutrition and health wellness to a more broad network. My dedication to this field of study (Nutrition and Toxicology) began in 2002 when I was learning about how to improve my health, nutrition, baby product selection and conserve resources. I realized that I was doing so much research on diets, nutrition, health and toxicology that I decided to begin a Masters of Science in Nutrition. This opened a new way of thinking as I began to realize how much we don't know about what is in our foods, cleaning supplies, and other every day household items. Since that time, I have been dedicated to this research and I have patiently developed each and every one of my (patented) formulas to target specific skin conditions and nutritional obstacles that most people struggle with all of their lives such as dry skin, rashes, weight problems, allergies, and common illnesses, among other topics. Along with running this company, I have the diligent and sacred duty of raising my 5 children (Mikayla, Nathan, Matthew, Madison & Abigail (our twin girls). They have served as an inspiration to me to ensure only the finest natural products ever reach their bodies. Since my first pregnancy in 2001, I have consistently improved my natural diet and nutritional habits to observe the results of a healthy and well developed nutritional lifestyle in my newborns. I can honestly say that this has been the greatest gift I could ever give to my children. Now, I want to share these discoveries with you. This is the most important reason I started this company; I want to reach other parents and people who share in the belief that there's no substitute for Mother Nature. Every product developed by The Homestead Company is made with a specific purpose in mind and to target a unique skin condition or problem. I take no short cuts, chances or risks when it comes to health and nutrition. Moreover, before these products ever reach any of our customers, I use them for my own family. This is how I know that this is the best I can offer. Our research and development of each product has proven to be a worth while endeavor as we have searched worldwide for the finest quality ingredients to make our unique formulas. We do not sacrifice quality and precision measurements for economies of scale. You only get one chance to make people trust and believe in your products. We are constantly improving our products based on the feedback of our customers and the discovery of new natural ingredients that may improve our original formulas. We always welcome feedback to ensure we are meeting our customers needs. Each batch is purposely made in small numbers to ensure precision and quality in every bottle. We do not outsource any of our work and we are dedicated to making each product with the personal touch. All made here in the U.S.A.
Our satisfaction comes from the knowledge that your family will always be treated as we treat our own. All of our formulas are meticulously prepared to maximize the results of the specific skin condition for which they are made and labeled. We believe in developing a strong relationship with our customers because their health concerns are our concerns. Most of our products began with a question or recommendations from our customers; so rest assure that you will always be taken serious and with respect. Makes a great gift or save money over buying individual products for yourself. Natural and effective ingredients. Everything you need for softening dry skin and maintaining soft feet all year long. Our all natural Hand & Foot scrub is made with dead sea salt, and raw shea butter. It's sure to soothe dry and cracked skin on hands and feet. Use the Peppermint/Eucalyptus Hand &Foot Lotion to soothe tired feet and help to heal dry skin throughout the day. The pumice stone is great for sloughing away calluses and rough skin. Most lotions have ingredients that actually dry out the skin, causing your skin to need more frequent applications. Once you try our lotion, you will experience the difference, and in the end actually save money. I get to give one lucky reader the foot set above! Thanks so much for the birthday wishes and your visits, even when I'm MIA which has been quite often lately. I can't seem to stay organizied, but that's okay...my life is full, right? Count me in! I love peppermint scent also! I would love to win this...I am a FACS teacher...I sometimes wear a pedometer at school...and have taken over 10,000 steps before 10 o'clock in the morning!! I follow, and have your link in my sidebar!! Woohoo! Please enter me! I follow! My hands and feet need this! Love peppermint smell and oils in body scrubs and lotions! I would love to try this!!! Count me in! Is that based out of Utah up Provo canyon? Wow...that's a pretty neat basket...I could really use some of that stuff! Ok this is right up my alley. Love it. Would love to win. I love stuff for pampering my feet too! Girl you have the best giveaways! I am of course a loyal follower and I've got that "calming" button! Like a lot of women, my feet are dry. Sometimes they are so dry they hurt. Anything that will soften up your feet and keep them in good condition is a "good thing"! love this stuff! love peppermint also! Woo hoo! I never treat myself to pedicures! That sounds like a lovely company and such fun, soothing products! I'm work on my feet most of the day, this sounds great for me. This would be fun to have! Thanks! We went to Cedar Mountain today. The autumn leaves were fantastic! Then a friend invited us to her house for authentic Danish food her friend from Denmark cooked. It was so yummy! Had a wonderful day. Hope you did, too. I'd love to win these cool stuff! I need something good for my flip-flop feet. OOOOOHHH this would be nice to win!I do love your giveaways! Whoa. No chance with this one. Too many entries. Oh, well. I'll figure out how to put your button on my blog this Tuesday in computer class. This would be a great one to win. Sounds like a simply heavenly way to spend a day! Sounds great! Please include me!!! This would be great for me since I have a lot of trouble with very dry feet! What a great giveaway. Please enter me. Sure could use the all natural Hand & Foot scrub for hubby.